While many yogis flock to the tropical beaches of southern India to hone their practice, it's hard to beat doing downward dog or meditating against the backdrop of the world's highest peaks. This roundup of the best yoga treks, retreats, and adventures in Nepal, from a yoga rafting trip on the Sun Kosi to a luxury yoga trek in the Annapurnas, will have you booking a flight before you can say Om-M-G. Whether you're seeking a post-winter detox or simply a relaxing adventure, these seven yoga getaways in 2018, ranging from 4 to 14 days, will give you the chance to experience the best of Nepal while allowing you to disconnect from reality and reconnect with yourself. Most yoga journeys have fixed departure dates, as they depend on the availability of a yoga teacher to join and lead the group. That said, there are yoga retreats and classes available year-round. And you can always customize your own yoga trip, particularly if you're an instructor or have a group of your own. Dates & Cost: April 20 - 24*; from $1695 per person. *Must register by April 5th. 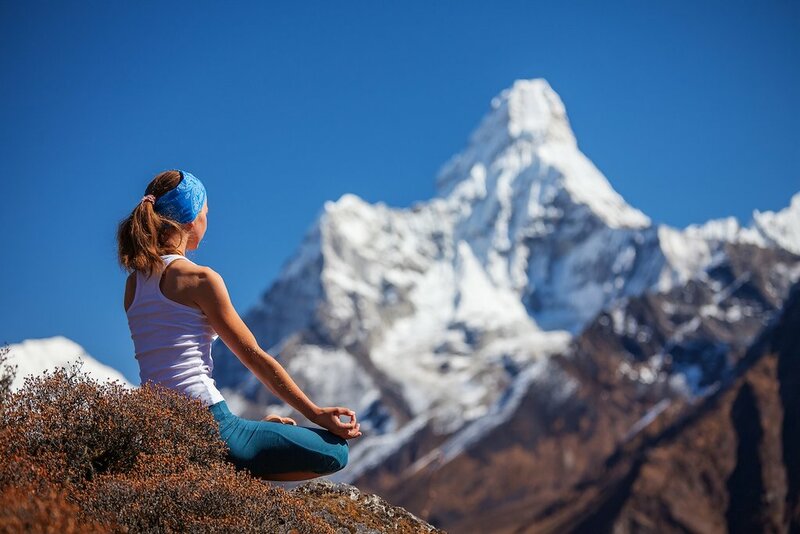 Channel your inner Sir Edmund Hillary — or Tenzing Norgay — as you practice high-altitude yoga and meditation on this once-in-a-lifetime trek in the Everest region, which should hold the top spot on every yogi-trekker's bucket list. After arriving and spending two days in Kathmandu, you'll catch a short and scenic flight to Lukla (9350 feet) where your legendary 11-day trek begins with Nepali hatha yoga instructor Madhab Prasad Dhakar and a local guide from the Khumbu region. 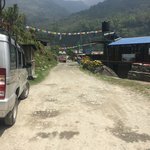 Organized by Kamzang Journeys, the route largely follows the first half of the Everest Base Camp trail except with more stops and interesting detours (such as to Thame), turning back after an overnight in Pangboche (13,040 feet), which is between Tengboche and Dingboche. Throughout this time, you'll be immersed in Tibetan-Buddhist culture, and will be staying at a mix of carefully chosen teahouses and boutique lodges, such as the lovely Beyul Hermitage & Farm. Yoga will be practiced each morning and afternoon in Kamzang's yellow yoga tent, set up just outside the lodges. Compared to the other treks and retreats on this list, this is the most challenging as you'll be sleeping above 11,000 feet on seven nights (three of which will be between 12,000-13,000 feet! ), which means less oxygen for trekking and, well, yogic breathing. But it's also the most rewarding — and spiritually moving — as it's the only one with views of Mount Everest and its awesome 26,000-foot plus siblings, which may have you wondering: does meditating on the top of the world bring you closer to nirvana? Dates & Cost: April 28 - May 11 & October 22 - November 4; from $2680 per person. 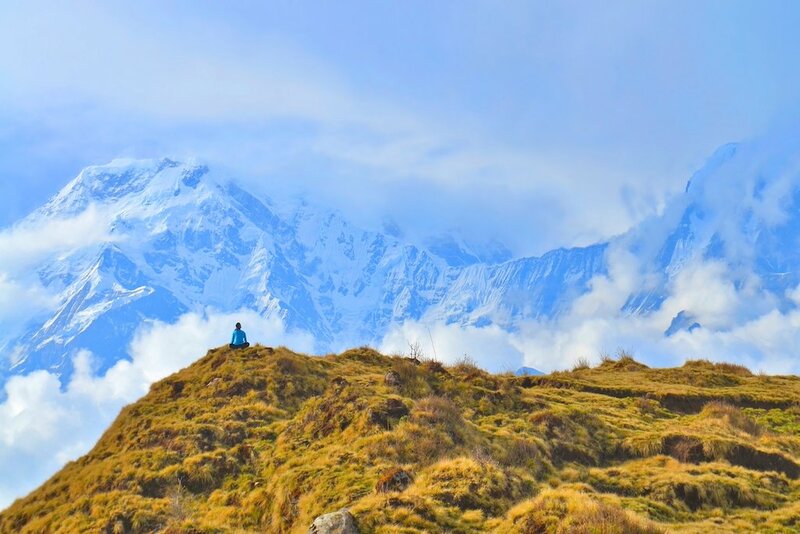 In June 2018, join yoga instructor Hayley Mia on a beautiful and revitalizing 6-day trek through the heart of the Annapurna foothills (maximum elevation: 6,160 feet) where you'll be staying at Ker & Downey lodges — the premiere trekking accommodations in this region. 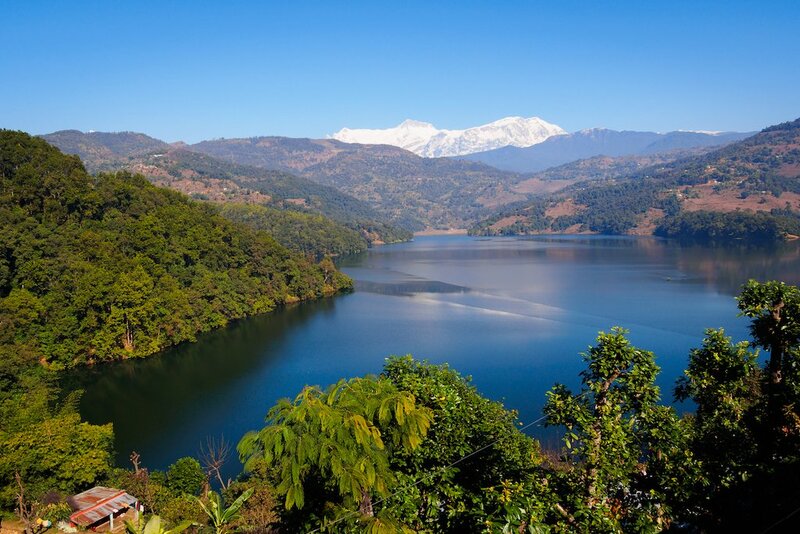 Soak up the stunning surroundings — that is, the sacred mountains, sub-tropical forests, rhododendrons, green terraced hills, traditional Gurung villages, and Buddhist chortens — just before the onset of the monsoons, with silent meditation walks, half-day treks from lodge to lodge, and (of course) outdoor yoga. During the trek, Hayley will take you on a 30-minute silent meditation walk and lead two 1.5-hour yoga sessions daily: hatha or vinyasa yoga in the morning to energize you, and restorative (yin-yang or slow yoga) in the evening to calm you. She can also give you a massage on request, as she's a certified massage therapist! Unlike the teahouses, you'll have your own private bath with hot running water, cozy blankets, and down bedding warmed by a hot water bottle. And your food —all vegetarian — will come straight from the organic gardens on the property. The trip begins and ends in Kathmandu, including three nights in Kathmandu and one night in Pokhara, along with the option of continuing your yoga practice for an extra three days in Kathmandu Valley. Dates & Cost: June 2 - 12; from $2480 per person, based on double occupancy. It's easy to forget the hustle and bustle of Kathmandu (read: dust and traffic) on this 5-day yoga retreat set at Park Village Hotel and Resort: a 5-acre oasis below Shivapuri Nagarjun National Park, whose grounds are home to flowering trees, butterflies, dragonflies and nearly 75 species of birds. Begin each day with 30-minute silent meditation walk followed by a 1.5-hour long energizing yoga session led by certified-instructor Hayley Mia. Then, partake in an activity, such as hiking to Nagi Gompa, a 100-year old Buddhist nunnery in Shivapuri Hills; meditating at a Buddhist monastery, or talking about philosophy and dharma with a Buddhist Lama. After eating your vegetarian lunch, you'll have some free time to either get a massage, have a one-on-one yoga session from Hayley or an ayurvedic treatment. Complete your day with a restorative yoga session each evening before dinner — the secret to a restful night's sleep, and the perfect way to unwind post-trek. Dates & Cost: June 12-16; from $880 per person, based on double occupancy. One of the world's top 10 rivers for whitewater rafting, Nepal's Sun Kosi is perfect for "zendrenaline" junkies (and beginner rafters, too) who wish to come down from the highs of riding Class III+/IV rapids by doing sun salutations and exhaling om on the river's white sandy shores. 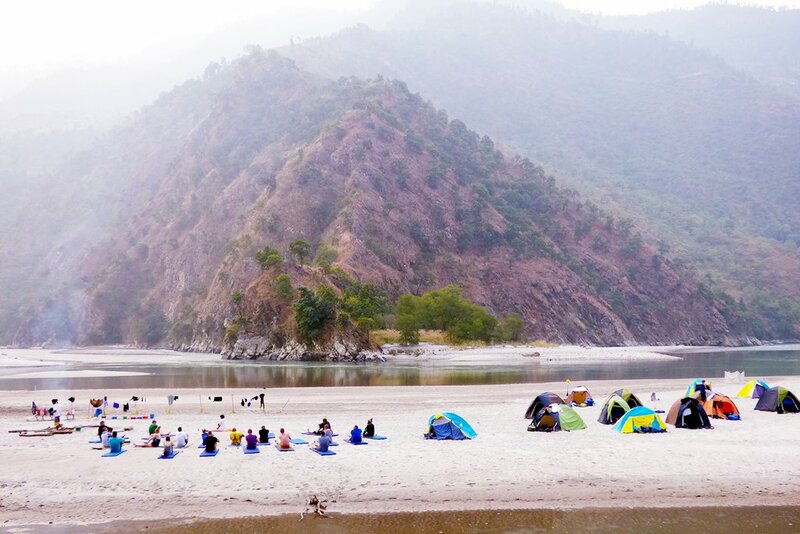 Over the course of this 9-day yoga rafting trip, which starts in Dolalghat (a 3-hour drive from Kathmandu) and ends in Chatra, you'll be waking up in your tents each morning to practice yoga at dawn with Gitte Nordentoft, a certified yoga instructor from Denmark who is equally passionate about kayaking and Nepal. Her classes combine classical, vinyasa and hatha yoga. If once a day isn't enough, you can partake in an evening session as well. And perhaps you should: after a day on the river, you'll have increased flexibility and heat in your body, which should allow you to go into deeper stretches and postures in a more dynamic flow class. The itinerary is similar to the standard Sun Kosi Rafting and Kayaking Trip. The only difference, besides daily yoga classes and occasional workshops on breathing, alignment and yogic philosophy, is that there will be an extra day just for yoga and no rafting. Dates & Cost: October 1 - 9; from $900 (includes complimentary yoga mat and transfers by bus). This epic yoga trek kicks off in Kathmandu, where you'll spend the first two days sightseeing and acclimating (including a chance to discuss Buddhism with a monk! ), before heading to Lower Mustang, a remote region in north-central Nepal that was once part of an independent Buddhist kingdom. To get there, you'll need to drive to Pokhara and then catch a flight to Jomsom: the launchpad for your 8-day yoga trek (suitable for all levels) led by Camilla Nicoline Vik from Norway, who is certified in flow arts, yin yoga, and hatha yoga. For the next week, you'll be practicing yoga amidst snowcapped mountains and historic villages, as you trek 3-5 hours each day across one of the ancient Himalayan trade routes to Tibet. 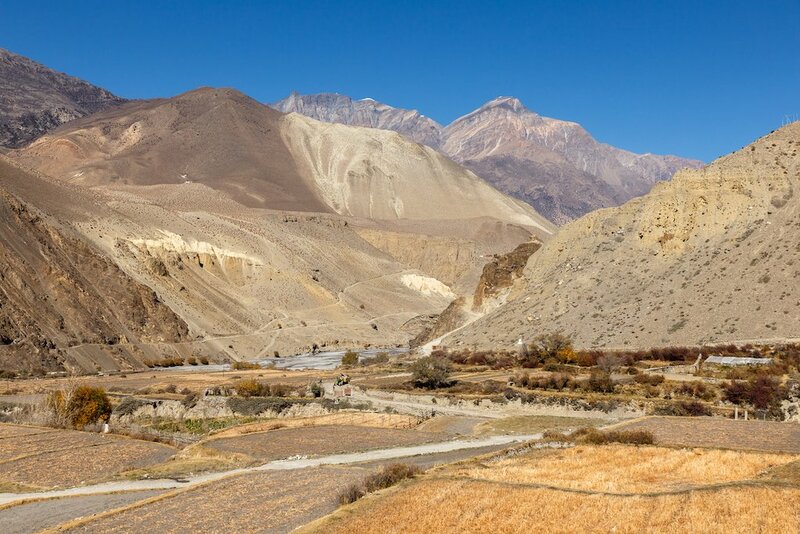 Aside from spectacular views of the Annapurna and Dhaulagiri ranges, highlights include exploring the medieval village of Kagbeni and the sacred pilgrimage site of Muktinath (12,473 feet; max. elevation reached on this trip), among other places, until reaching Tatopani, where you'll have the chance to soak in natural hot springs before returning to Kathmandu. Ahhh-mazing. Dates & Cost: October 10 - 23*; from $2850 per person. *Based on a minimum of six confirmed participants.